What is a decision? A decision is a choice between 2 or more possibilities. For example, if you are lost while driving down a one way road and come to a fork in the road, you must make a decision. You must decide whether to turn right or left. The simplest decision you can make is one where a MINIMUM of 2 possible choices are involved. While driving down the one way road, until you come to the fork in the road, you have no choice in your behavior, you must continue driving forward. 1) I have come to a fork in the road. and 2) I have not come to a fork in the road. 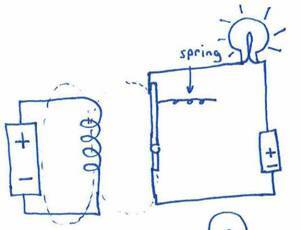 The simplest “If Then” decision making machine you can build is simply an electrical switch. 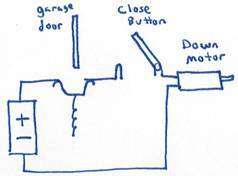 An electrical switch is nothing more than a way to open and close a circuit. 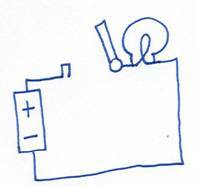 A circuit is a piece of wire connecting two ends of a battery together. The loop formed by connecting the wire to the ends of the battery is called a closed circuit. 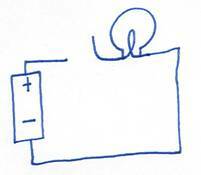 If one of the ends of the wire is removed from the battery, the circuit is said to be opened. 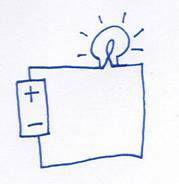 If a light bulb is connected to a closed circuit, the electrical energy from the battery will travel from the battery, through the wire, and through the bulb, lighting the bulb. If you disconnect one of the ends of the wire from the battery, the circuit is said to be open. 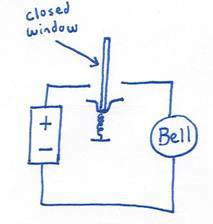 Electrical energy will not travel through an open circuit, and the light bulb will turn off. A switch is nothing more than a convenient way to open and close a circuit. Literally, a switch itself is a piece of wire. When you open the switch, the circuit the switch is connected to is opened. 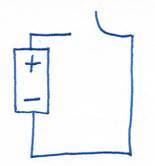 Electrical energy will not travel through an open circuit, and the light bulb will turn off. 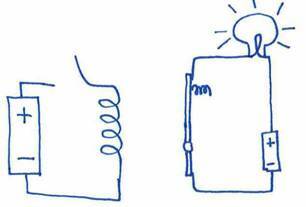 A switch is a representation of the decision, IF the switch is closed, THEN light the bulb. Like all decisions, the decision to light the bulb involves more than one possibility. In this case, there are two, either the switch is closed OR the switch is open. The statement, “I have come to a fork in the road”, is also called a PROPOSITION. A proposition is a statement that can be either true or false. The proposition “I have come to a fork in the road”, like ALL propositions, has 2 possibilities…It is either true OR it is false. Because a proposition always has a minimum of two possibilities, either true or false, any proposition can be represented by a SWITCH! On page 11 of his paper, Shannon defines a closed loop circuit as representing a TRUE proposition. He then defines an open circuit as representing a false proposition. Propositional Logic is the study of the logical relationships between 2 or more propositions. In his 1858 book titled “The Laws of Thought”, George Boole showed that there are only 3 possible relationships between any two propositions, from which propositional statements of greater and greater complexity can be derived. 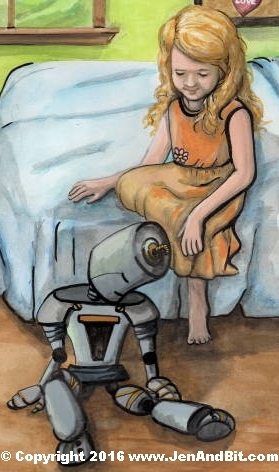 These are the AND relationship, the OR relationship, and the NOT relationship. Building your second decision making machine, a burglar alarm. “IF the window opens THEN sound the alarm. These instructions are in the form of a decision, and this decision, like ALL decisions, can be represented by a switch. Below is a picture of a switch like the one drawn above, only this switch is permanently kept open as long as the window is closed. 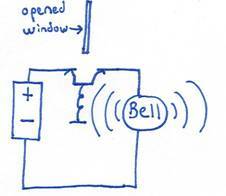 When the window is opened, a spring beneath the switch pushes the switch closed, closing the electrical circuit and causing electrical energy to travel through the bell, ringing the alarm. IF the window is open THEN sound the alarm. 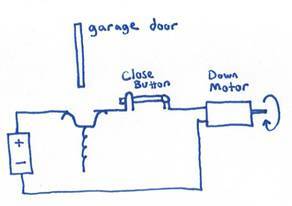 Machines that make multiple decisions at the same time, AND and OR circuits Memory square 2 in the Garage Door Opener Circuit actually has two IF THEN statements. A machine that must make more than one decision at the same time can be created by connecting switches in series. 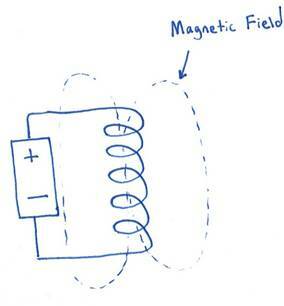 If you wind a piece of wire into a coil and connect the ends of the wire to a battery, a magnetic field will be created around the coil. The more loops there are in the coil, the stronger the magnetic field will be. 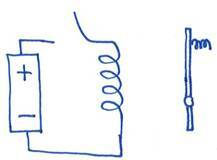 A coil connected to a battery is called an Electro Magnet. 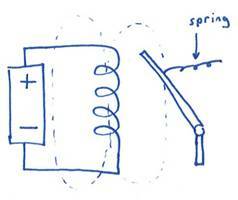 If you place a metal hinge connected to a spring next to an electromagnet, the magnetic field will pull the hinge towards the electromagnet If you OPEN the electromagnet circuit, electrical energy will stop traveling through the coil, and the magnetic field will be destroyed. With the magnetic field gone, the spring will pull the metal hinge back into place. The metal hinge itself can be thought of as a switch, which can be opened or closed by the presence of the magnetic field. 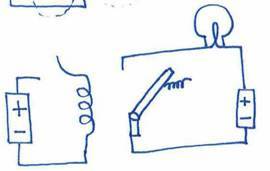 In this illustration, the magnetic field pulls the switch closed, lighting the bulb. 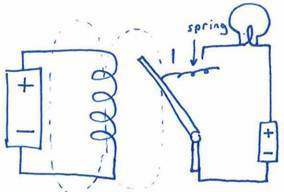 When the magnetic field is gone, the spring pulls the switch open, and the bulb turns off. 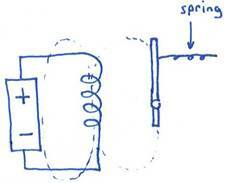 A metal switch, held in one position by a spring, and in another position by a magnetic field, is called a RELAY. All relays basically consist of a two separate circuits, a coil circuit to generate a magnetic field and a metal switch circuit. Below is a relay that turns the bulb OFF when the magnetic field is present, and ON when the magnetic field is gone.